Qatar's emir Tuesday pledged $1.25 billion in financial support for Tunisia's struggling economy. Speaking at an investment conference in Tunis, Sheikh Tamim bin Hamad al-Thani said Qatar would provide assistance "to support the Tunisian economy and strengthen its process of development." He did not give further details on the package. "In Tunisia we face a people who decided to build their country based on plurality, dignity and human freedom," he said. "Will we help them so that the experience succeeds, or so do we just watch them face the difficulties alone?" He was speaking at an international meeting for business and political leaders that the Tunisian government hopes will attract billions of dollars of much-needed investment. 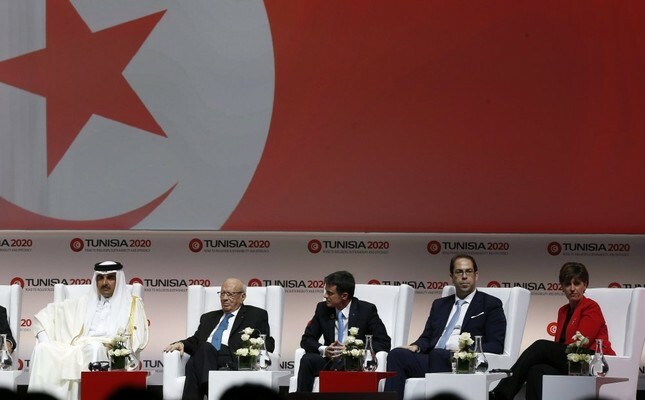 More than 2,000 leaders from the worlds of business, finance and politics - including French Prime Minister Manuel Valls - are attending the "Tunisia 2020" conference. Tunisian officials hope it will put the country "back on the investment map of the Mediterranean." They are hoping to find bidders on some 140 projects - from infrastructure to hi-tech ventures - worth around $32 billion. Nearly six years since a revolution that toppled dictator Zine El Abidine Ben Ali, Tunisia faces high unemployment, low growth and a tourism sector hammered by terrorist attacks.